Kontakt instrument of a deeply sampled Kora – a West African harp. FEATURES: 18 samples per note (6x round robins, 3x velocity layers). MICS: Built in pick-up and stereo close mics. PRODUCT INFO: 1.96 GB download (2.54 GB when extracted). Over 1,500 samples. The Kora is a 21-string West-African harp, that has been played for centuries in Mali, Senegal and The Gambia. The Kora we sampled was constructed by Adam Doughty and is Josh’s favourite to play. It’s made from a calabash gourd cut in half, covered with a Bristol red deer skin, fitted with a Sapele wood neck, fishing line strings and the machine heads used to tune the instrument are from China. Adam Doughty has been making Koras for over 20 years and sells his Koras across the globe (The Kora Workshop). Josh has been playing the Kora since he was 7 years old. He is a true master of the instrument. He travelled to Mali in 2007 where he was invited to further his studies in the instrument under the world famous Kora master Toumani Diabaté. Josh now travels the world performing and teaching the Kora at festivals, universities and events. He’s great at combining traditional Malian rhythms with modern Western influences. Check out his TED talk. 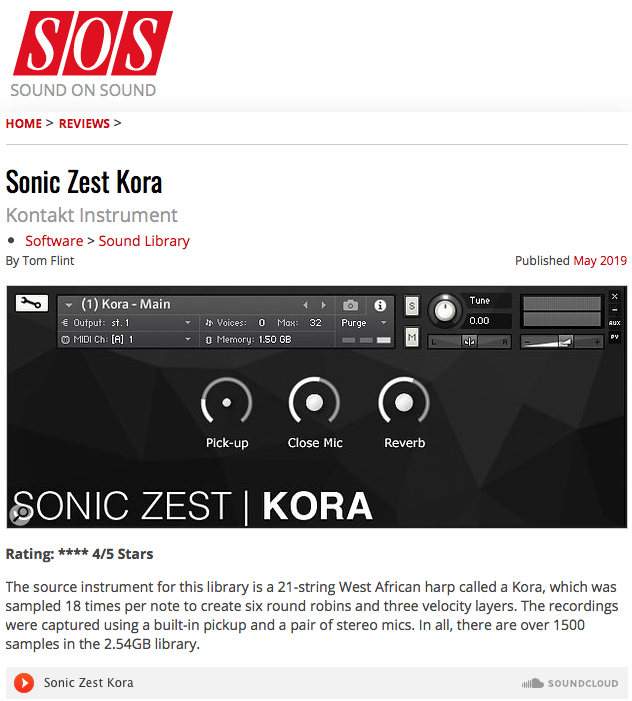 Sonic Zest’s Kora is a deeply sampled instrument that uses 6x round robins and 3x velocity layers. As well as the standard finger plucked sound, other articulations include fast tremolos, slow tremolos, glissandos, staccatos, harmonics and trills. The library comes with 9 patches. Take a preset tour of the various articulations. Main – This is the normal articulation. When played softly, the Kora has a distinct orchestral sounds to it. When played hard, the sound produced is slightly twangy and even guzheng like in sound. Lite – The only downside to deeply-sampling instruments is that CPU usage quickly ramps up when you have 18 samples per note. That’s why we have included a lite version, that uses 1/6 of the samples and employs innovative borrowed-round robins technology to ensure that realistic playability isn’t compromised as a result. Performance – We’re particularly proud of this patch. It emulates the playing style of the Kora. The lowest note, F1, is assigned to middle-C. The notes then go up in pitch both directions, left and right, across only the white notes. This is because Kora’s are normally tuned to the chromatic scale. This patch allows you to play the low notes with both thumbs and the high notes with the fingers, just like you would on a real Kora. Harmonics – This articulation is rarely used in traditional performance. The sound is made by lightly touching the string halfway up and allowing it to ring out. Slow Tremolo – This is our favourite articulation. You have to get this under your fingers. Gently playing soft chords creates a swarm of notes swirling around in stereo. Try stacking this with the Main patch to create a beautiful combo. Fast Tremolo – Like the slow tremolo, this also has a swarm-like sound to it, but at the same time is mildly reminiscent of an organ. This is great for laying down fat chord progressions for you to play over. Staccato – This articulation was created by muting the note once it was plucked to prevent the sound from ringing out. This is actually the main articulation traditionally used by Kora players. Glissando – This articulation is not really authentic to the Kora, but is used by orchestral harpists. It sounds great nonetheless! Trills – Lastly we present trills! This is a pattern of 3-notes played in quick succession. It adds great realism to any composition. The Kora was recorded using both the built-in pick-up and a pair of stereo mics. The user interface allows you to find your optimum mix of the two. A light bit of reverb helps accentuate the sound and bring it all to life.